Northern Illinois University’s STEMfest is an annual celebration of science, technology, engineering and math that strives to introduce all people to the wonders of science. However, for some adults and children, a loud, bright and crowded environment makes it hard for them to feel welcome. That’s why this year, the STEMfest organizers are introducing a new low-sensory hour. STEMfest will be open to the public from 10 a.m. to 5 p.m., and the low-sensory hour will run from 4 – 5 p.m. on Saturday, Oct. 27, in the NIU Convocation Center. During the low-sensory hour, the lights will be dimmed, the stage speakers will be turned off, and exhibitors will be encouraged to replace loud or flashy activities with something quieter. NIU STEM Educator Sam Watt, one of the STEMfest organizers, says the low-sensory hour is designed to help families and individuals with sensory disabilities, including those on the autism spectrum, feel more comfortable at STEMfest. Watt emphasizes that during the entire day of STEMfest a quiet room will be available, as well. “This quiet room is a place where individuals or families can step away from the festivities to recharge before heading back to the fun.” He also encourages visitors to take advantage of the detailed exhibition map that will be posted on the STEMfest website one week before the event (Go.NIU.edu/STEMfest ). This will allow families to plan their activities so that they can minimize time in the potentially crowded environment. Izzy Johnson practicing an experiement. 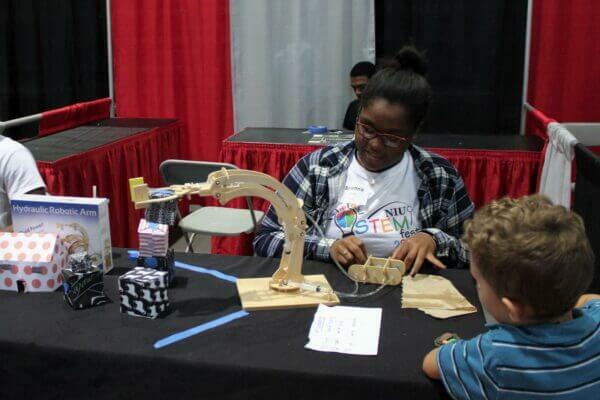 Izzy Johnson, an NIU student majoring in rehabilitation and disability services and minoring in psychology and deafness, suggested the new low-sensory hour, and the STEMfest team was eager to implement her idea. 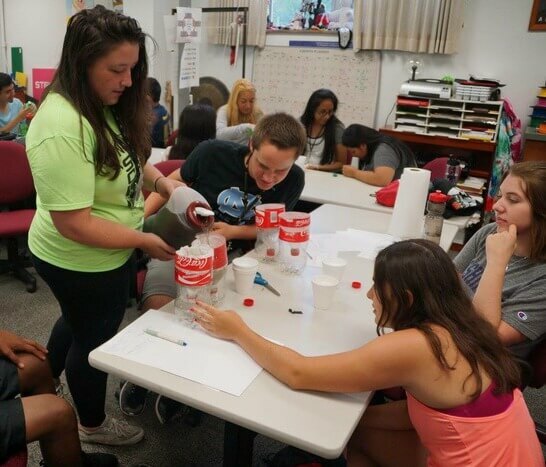 This knowledge motivated Johnson, who has worked as a counselor at NIU STEM summer camps, to apply some of the accommodations that she and other counselors were already using in summer camps to make STEMfest more accessible to people with a variety of disabilities. The low-sensory hour is part of a broader push to make STEMfest even more inclusive this year. The STEMfest organizers are also excited to welcome Zot Artz Studios, led by Dwayne Szot, who will be helping STEMfest visitors make a large interactive art piece throughout the day. Zot Artz makes adaptive art tools so that children with disabilities can create huge, amazing art pieces. STEMfest will take place from 10 a.m. to 5 p.m. Saturday, Oct. 27, at the NIU Convocation Center. NIU departments, student groups, regional corporations, museums, educators and national labs will team up to offer more than 200 science, technology, engineering and math (STEM) related activities. This year will also mark the first Northern Illinois Mini Maker Faire, which will be held in conjunction with STEMfest. The low-sensory hour will apply to both events. These family-friendly events are free and open to the public. No registration is required, and parking is free. While most of the exhibits are completely free, books, T-shirts, electronic kits and other STEM-related items will be offered for sale.